Our Microfiber Bath Rugs look and feel like soft cotton bath rugs, and are extremely durable and color fast. They are machine washable and dry very quickly due to the microfiber. 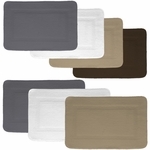 The Frisse Shag Rugs come in two sizes and make for a nice kitchen or area rug. They are two toned and can add a color pop to a kitchen floor or an entry way. Questions about our washable rugs? Please call 803-599-5410 and we will be glad to assist you. Small $7.95/ea. | Standard $8.95/ea.